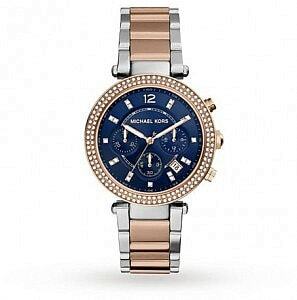 Michael Kors Mini Darci Blue Mother of Pearl Dial Price In Pakistan. Stainless steel case with a two-tone (siver and rose gold-tone) stainless steel bracelet. Fixed rose gold-tone bezel set with crystals. Blue mother of pearl dial with rose gold-tone hands and index hour markers. Dial Type: Analog. Quartz movement. Scratch resistant mineral crystal. Pull / push crown. Solid case back. Case size: 33 mm. Case thickness: 7 mm. Round case shape. Band width: 10 mm. Deployment clasp. Water resistant at 50 meters / 165 feet. Functions: hour, minute, second. Dress watch style. Michael Kors Mini Darci Blue Mother of Pearl Dial Ladies Watch MK3651. This dainty watch has been created in the style of an evening or cocktail watch, but we wouldn’t suggest limiting this watch to nights out – it’s the perfect way to add some glamour to a daytime outfit too. It features a gold-tone stainless steel case and bracelet, gold-tone dial and crystal-set bezel. 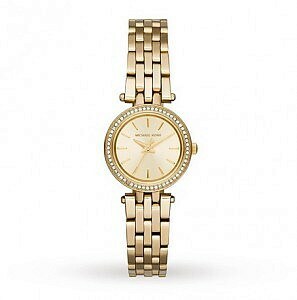 For fans of sparkle you could wear this watch with lots of jewellery, or on its own with a simple outfit to allow it to stand out. The Petite Darci is a popular model with Goldsmiths customers, and with its dazzling looks we can see why. Like all the watches in the Parker collection, this model has it all. Not only does it look great with its PVD rose gold-plated and stainless steel case and bracelet, crystal-set bezel and blue dial, but it’s also highly functional. As well as telling the time and displaying the date, this watch has a chronograph (stopwatch) function – handy if you’re timing some cooking, or your friends racing around the block! The navy blue dial – with the Michael Kors logo displayed proudly – is very fashionable in the watch world right now with more people opting to ‘feel the blues’ when they buy a new timepiece. 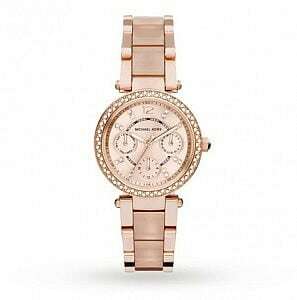 Michael Kors’s eye for detail is apparent in this stunning Parker Blush model. Note the matt texture of the rose gold-tone link bracelet, which is complemented by the high shine of the pearlescent resin inlay. This stainless steel watch merges classic with contemporary design – the chronograph pushers on the side of the case have a vintage feel, yet the subdial at 6 o’clock is thoroughly modern. 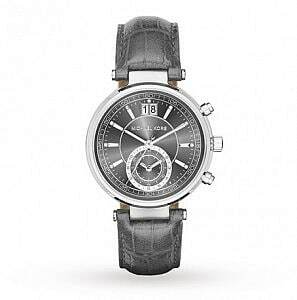 The embossed grey leather strap adds a final touch of elegance.